This post might qualify for one of those Jeff Foxworthy “You might be a redneck if…” parodies. Read on to find out the latest way we managed to set the lawn on fire. Recycling and trash pickup options are extremely limited where I live (several miles out of town). We do what we can, but like most farm and ranch families in our area, we maintain a burn pit for items that cannot be recycled. Last night seemed like a perfect candidate for this chore–no wind and a prediction for precipitation (snow) over night. I sent the boys outside with the garbage cans and a lighter. I watched the whole process while working on supper and was satisfied that all was well. About 15 minutes later, middle son loudly announces…”Mom, the lawn is on fire!”. Sure enough, a triangle-shaped line of fire was spreading slowly across our dormant buffalograss lawn. We all swung into action (it has almost become an annual tradition to set the lawn on fire, but I’ll save those stories for another day). The older sons were issued shovels and I ran for a garden hose. It was around 18 degrees, so finding garden hoses that did not snap immediately upon trying to uncoil and hook them up to an exterior faucet was a little harder than I expected. The compost pile we maintain for dead cows is about a 1/3 mile away from the house. How did two cow skulls and assorted cow bones still end up here? I am sure the dog is quite attached to her dead rabbit chew toy, but maybe she should consider leaving it in the pasture next time. 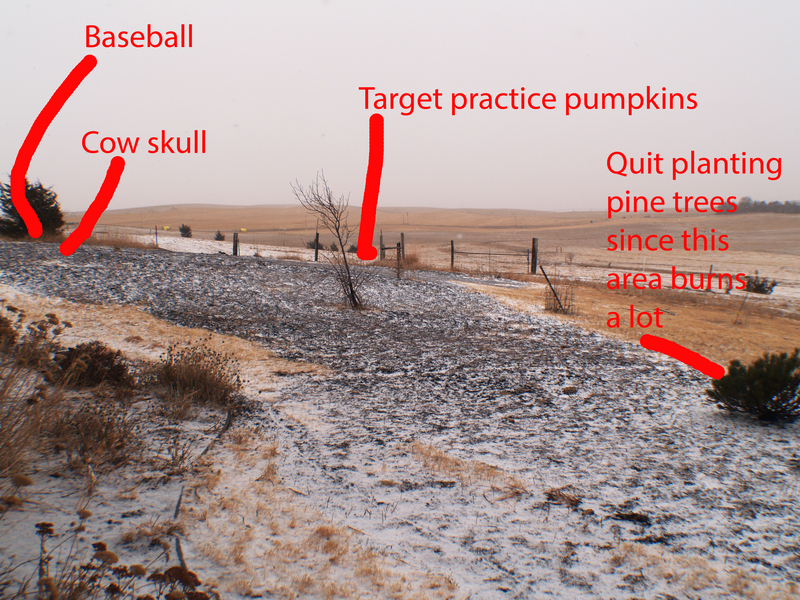 Did the boys really think I would not eventually notice the pumpkins they used for target practice hidden in tall grass rather than the compost pile? A roll of rusty barbed wire seems like a great decoration for a flower bed, but it is actually quite destructive for frozen garden hoses and ankles when placed near the water source during emergency situations. Why does the grass burn, but not dog poop? Hey! I found the baseball! I am grateful the fire did not reach to our CRP area (lots of tall, standing, dry fuel). That would have necessitated a call to the local volunteer fire department and a great deal of ribbing by the firemen in the future. As it was, my young firemen were quite hungry and had great stories to tell Dad when he arrived home.